AMD just released their new Radeon VII consumer grade graphics card that is targeted for gamers and prosumers. While NVIDIA have been enjoying the performance lead for the past few years, the Radeon VII is said to be a serious new contender in the consumer GPU space. It is the world’s first 7nm gaming GPU, and is designed to deliver both excellent gaming and professional application performance. AMD also improved the Vega graphics architecture. The new Vega 20 architecture has been optimized, allowing AMD to further bump up the frequencies of the Radeon VII and improve compute performance in both professional and gaming workload. Furthermore, AMD saw that current day workloads are starting to require more and more video memory. Gamers are playing at a higher resolution, and games are using more graphical features which takes up video memory. As for content producers, there is also a need to produce content of higher resolutions of even up to 8K resolutions. Therefore, to prevent users from running into video memory limitations, AMD included a large 16GB HBM2 memory on the Radeon VII. This is also coupled with a larger 1TB/s memory bandwidth and a 4096-bit memory interface. This ensures that regardless of the type of applications you are running, the memory configuration on the Radeon VII will be more than enough. While the improvements on paper can be great, the truth lies on in the experiments we will carry out on the AMD Radeon VII. Does this graphics card really perform as good as advertised? Or is it simply a waste of 7nm technology on a GPU architecture that is fundamentally lacking? We will let the performance results do the talking. We are going to put the AMD Radeon VII to the test, focusing on gaming workloads. We are going to test a couple of games in both 1080p and 4K resolutions. Their respective game settings are shown below. We will be comparing these scores with the AMD Vega 64, NVIDIA GTX 1080Ti and NVIDIA RTX 2070. Furthermore, we are going to run the AMD Radeon VII with the usual synthetic graphics benchmarks, 3DMark Time Spy and 3DMark Fire Strike as well. After discussing about the performance results, we will also take a look at the power consumption and temperatures of the AMD Radeon VII. We will also measure both the temperatures of the GPU core and the power consumption of the whole system at idle (defined by a restarted system that is resting at the main desktop). The readings will be taken at the 3-minute point after the system has fully booted up. We will also capture both the temperature of the GPU core and power consumption of the system at load. This is defined as the end of the 2nd scene on the Final Fantasy XV (4K, High) benchmark. The GPU temperature is recorded by HWMONITOR software, and power usage is taken with a physical power meter. If you are gaming at 1080P resolution, we are certain that the AMD Radeon VII will be more than sufficient to meet the requirements. It was able to meet the minimal 60FPS requirements while on 4K resolution for many games as well. Gamers can choose to play at games of even higher settings to enjoy the full game experience. Comparing the AMD Radeon VII and the GTX 1080Ti, we can say that both cards faired similarly. Sometimes, the Radeon VII scored better, while there are also times where the GTX 1080Ti was superior. We believe that some games are also optimized for the NVIDIA graphics card, and therefore, were able to perform quite a bit better on the GeForce graphics cards than the Radeon graphics card (particularly Final Fantasy XV, World of Tanks Encore, Tom Clancy: The Division, Rise of the Tomb Raider). The synthetic benchmarks also tend to perform better with NVIDIA graphics card as well. It could likely be the more advanced GPU architecture on the RTX 2070 that allowed the card to perform better than the Radeon VII at 1080p resolutions. On the contrary, the Radeon VII faired better in 4K resolutions. It is assumed that the large amount of video memory came into good use, allowing the card to perform sufficiently without any memory bottlenecks. This also showed that 8GB of video memory is likely insufficient for gaming at 4K resolution. This is not an issue with the GTX 1080Ti, which had 11GB of video memory. From the tests, the improvements from the Vega 64 to Radeon VII was apparent. Generally, we saw about a 50% improvement in FPS produced on the the Radeon VII. 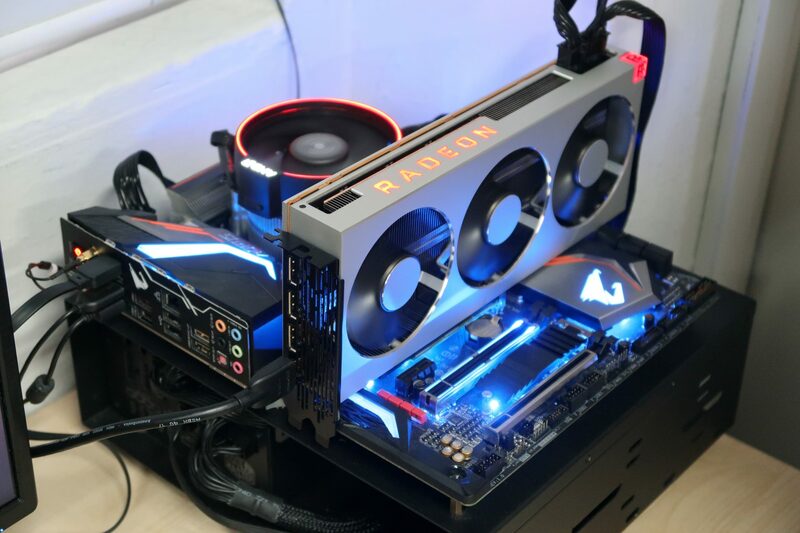 It was considered worrisome for us while monitoring the temperature on the AMD Radeon VII. While it all seems good on idle, measuring a temperature of 34-degree celsius just after system startup and drawing a of 55W of power, things starts to get somewhat odd when stressed the graphics card. On load, the GPU went up to a high temperature of 108-degree celsius, as measured on the CPUID HWMONITOR software. Of course, it could be an anomaly as the software has yet to fully support the new AMD Radeon VII graphics card. However, if the reported temperatures are true, the Radeon VII does really run hot. At that rate, the system was drawing about 350W of power from the mains as well. We can assume that the whole graphics card takes up about 300W of power. These temperature figures were also confirmed with AMD’s own Radeon WattMan software. During the Final Fantasy XV benchmark, the thermal junction temperature did rise to over 100-degree celcius. We had higher hopes for the AMD Radeon VII graphics card, especially with the various new and improved technologies that were included in it. However, as compared to the two-year-old GTX 1080Ti graphics card, which is currently priced same at 699USD, the Radeon VII fails to give us a clear answer that it is superior. In fact, it runs short in some games, and the increased 16GB of HBM2 memory also fails to shine, as the GTX 1080Ti’s 11GB is already more than sufficient, even when running games at 4K resolution. On a side note, we must also consider that we are using an early release of the AMD graphics driver, and that new driver updates could also improve the performance of the Radeon VII in its gaming performance. Don’t get me wrong. The AMD Radeon VII is very capable. This is the probably the first product from AMD since the last few years that sits nicely at the high-end GPU segments when including products from its main rival company. In the past, there just wasn’t a product from the red camp that is capable of reaching such a performance level. Finally, gamers will have a harder choice to make when choosing between an AMD or NVIDIA graphics card in the high-end space. It’s just that, we expected that the AMD Radeon VII could perform better. Now, it just seems that the Radeon VII doesn’t have a clear proposition against competition. It seems that AMD is going to have a tough fight with NVIDIA in the GPU space. With NVIDIA’s latest technologies such as Ray-Tracing acceleration and unique features that improves graphics quality without the need to reduce performance, NVIDIA is leaps ahead in terms of the technology they provide. Regardless, AMD still has its space in the market as well. Its large video memory size is sure to benefit specific applications that’s used by content producers, or applications in the future that runs at resolutions higher than 4K. Perhaps, if you do have some plans for such use case today, then nothing comes close to the Radeon VII. However, if you are just a gamer, like most people, perhaps the GTX 1080Ti from the green camp could still be a better choice (unless AMD proves us wrong with drivers that increases the performance of the Radeon VII significantly). The launch of the AMD Radeon VII really showed us the outdated Vega graphics architecture. Even though AMD did improve the architecture, it still fails to stand up against competing technologies. With the time that AMD has been working on their graphics technology, we would wish that the next generation GPU architecture, code-named Navi, would dramatically improve GPU efficiency and performance. Let’s keep our fingers crossed and see what AMD has got up their sleeves next.